La Rondine is a beautiful Tuscan Villa set within 5 hectares of lush communal gardens with access to a 20 m shared pool complete with sun loungers and umbrellas. 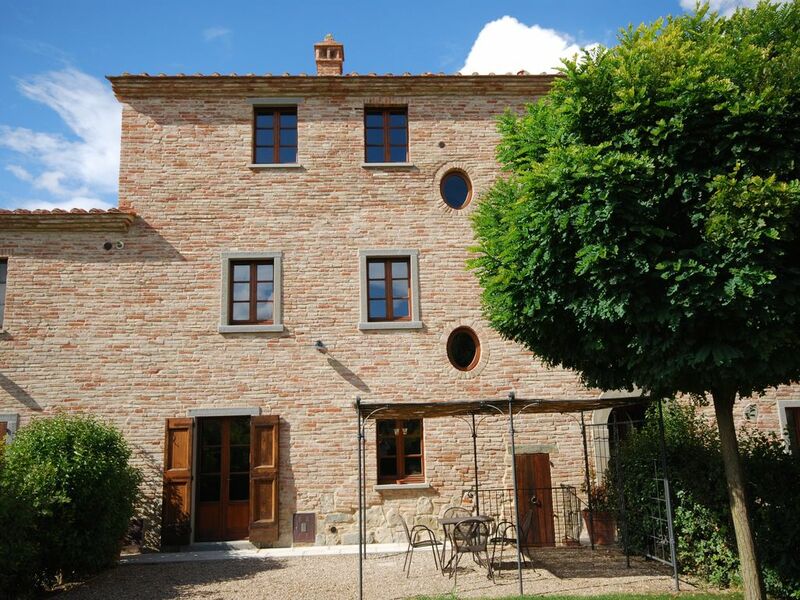 Set within the Il Pino hilltop development of traditionally styled and renovated Tuscan farmhouses, this three bedroom, two bathroom villa is part of the main farmhouse and is entered via a private garden, complete with shady pergola for outside barbecuing and dining. Well appointed family-friendly accommodation is offered over three floors, each one lovingly restored to include original period features such as the original stone staircase. The ground floor benefits from a large open-plan kitchen living space and WC, the first floor comprises two traditionally decorated twin/king size bedrooms and a family bathroom with shower, and on the top floor you'll find a spacious master suite with stunning panoramic views of surrounding olive groves and sunflower fields. Facilities: The villa also offers entertainment for the whole family in the form of a Wii, iPod docking station, TV and DVD player, and a library of DVD films, books and board games. Outside you'll find a table and six chairs and a BBQ for alfresco dining and inside, a dining table and chairs, lounge with comfy sofa and armchair, together with full central heating and a wood burning stove in the lounge for cooler evenings. The villa's well-appointed kitchen benefits from oven, gas hob, dishwasher, fridge with freezer compartment, toaster and a kettle, and you'll also find a washing machine, ironing board and iron, clothes airer, travel cot and high chair, should you need them. Expect to find bedlinen, travel cot bedding, bath towels and pool towels for your convenience. Enjoy a chilled bottle of wine on the terrace as the sun goes down. Welcome to a relaxing holiday in a truly delightful setting. The swimming pool is open from the end of May to the middle of September, weather permitting. I stayed with a friend who has visited Tuscany before, so the combination of a great guide and this charming villa ensured a wonderful first visit. I felt as if I was in one of the many films that have been set in Tuscany. Days spent visiting Cortona, Montepulciano, Siena, Lake Trasimeno, Florence and much more, and then returning to the villa for a glass of local wine whilst listening to the birdsong, so relaxing. Do try La Grotta restaurant on the edge of Montepulciano and locally Agrisalotto, with fabulous views towards Cortona. This gorgeous Villa set in the midst of the rolling hills of the Tuscan countryside does not disappoint. The bedrooms on the 1st floor were comfortable and each had a chest of drawers to accommodate our clothes and there was a shared toilet with basin and shower. The upstairs bedroom was very large with an ensuite bathroom, wardrobe and chest of drawers. All rooms had spectacular views. The downstairs living area was open-plan with high-beamed ceilings and tiled floors and consisted of a kitchen area, dining area and living area. There was a comfortable couch and a wood-burning stove for those cooler evenings. Outside, there was an attractive pergola with table and chairs for 6 people. The surrounding gardens were well taken care of and created a very peaceful ambience. The Villa was nicely situated to visit many of the famous surrounding towns and cities. Please note, a rental car is a necessity on this holiday, but driving is relatively stress-free. Most of the attractive towns were within an hour’s drive. The historic town of Cortona was one of our favourite places. It was full of interesting buildings and little souvenir shops selling local produce. There were many restaurants and cafes where you could enjoy an authentic Italian meal and a carafe of local wine, or treat your self to an ice cream at the Gelateria. A walking trip up to the Monastery in this town is essential as the views are incredible and the cobbled streets very quaint. We also visited the hilltop town of Montepulciano and enjoyed the panoramic views of the surrounding countryside. It is famous for it’s wine production. Another memorable trip was to the ancient town of Siena which was bustling with people. Here we had lunch on the Market Square where the famous horse race, La Palio, takes place. On another day we took a trip to Lake Trasimeno stopping at various towns surrounding this beautiful stretch of water. We were also very impressed with the town of Pienza, and enjoyed yet more spectacular views as well as a good selection of shops and restaurants. If you are looking for a relaxing holiday, in a peaceful setting and enjoy experiencing the local Italian wine and cuisine, this is the holiday for you. You will love exploring the many different hilltop towns whilst taking a leisurely drive through the beautiful Tuscan countryside. Il Pino is a secluded estate of farmhouses on a hilltop overlooking the stunning Val di Chiana countryside in southern Tuscany. The atmospheric Etruscan town of Cortona is 20 min away by car, where you can explore the cobbled streets, museums and shops, and dine in the many fabulous restaurants.The peaceful rural location also boasts easy access by car to the famous wine producing areas of Montepulciano and Montalcino, where you can sip a glass of fine Brunello in the castle grounds. Pienza is about 30 min by car and is a favourite place to buy local pecorino cheese and to watch the swallows swooping over the valley as dusk falls. Other towns worth visiting are Siena, for the wonderful shops and famous Palio horse race, and Arezzo where 'Life is Beautiful' was filmed. Lake Trasimeno, Italy's fourth largest lake, is 20 min away where you can enjoy water sports or take a boat ride to an island for a memorable lunch. Outlet shopping at Valdichiana is 10 min away. Golf: The Valdichiana Golf Club is 6 km away with a 9 hole course. Clubs and trolleys can be hired at the club - see their website for full details. The Perugia Golf Club is 51 km away with an 18 hole par 72 course. Ski: Skiing is available at Monte Amiata during winter months only. Ski equipments can be hired at the resort. A deposit of 50% of the total rental is required at the time of booking and the balance is payable 2 months before the holiday start date. A security deposit of €300 is required and will be collected on arrival at the property. This deposit will be returned on departure once the property has been checked and the keys returned. No refund is payable within 14 days of the holiday start date. Change over day is Saturday, but can be flexible for late bookings. Please email your requirements. The property is available after 4 pm on the day of arrival and guests are kindly requested to leave by 10 am on the day of departure.